Ingredients: Water, Tomato Puree, Enriched Pasta, High Fructose Corn Syrup, Salt, Enzyme Modified Cheddar Cheese, Disodium Phosphate, Enzymes, Vegetable Oil, Enzyme Modified Butter, Skim Milk, Citric Acid, Paprika Extract, Onion Extract, Flavoring. Age: 130 years old, but Ma has only been sentient for the last 30. Backstory: Ma was once a normal can of soup that sat on a shelf for 100 years, but on a day like any other he was picked off the shelf and purchased for a discount price, unbeknownst to the unlucky buyer this can of soup had gained its own soul and will, and after being microwaved and nearly eaten the bowl of soup screamed out in a psychic wave of pain and fear, it nearly rendered the poor soul that was about to eat it nearly brain dead. It took control of the person who sat before it and had them construct at first a simple body for them, but as time went on its body grew more elaborate, Ma now has a fully functioning body and wishes nothing more than to control the one aspect of his life he never had a any control over. Voice: (In Comics Ma Speaks in balloons with not tails Font ChubbyCheeks) Ma communicates with telepathy, projecting his thoughts into others’ minds. Anyone Ma can see and anyone who can see Ma can hear what Ma is “saying”. Projecting his thoughts is a passive effect, so Ma does not have the ability to hide his thoughts from those within visual range. Ma can project his thoughts through cameras and other video devices, but it has to be a live feed. His voice cannot be recorded. Ma communicates by projecting meaning rather than a specific voice, so people would be hard pressed to give specifics about what Ma’s “voice” sounds like. Even the perceived gender of it is murky and it seems like people can only remember meaning rather than a sound. People do, however, tend to report that he seems to have a wholesome Southern accent. Body: Ma pilots a robotic body powered by an unknown fuel source. It has a battery in its chest, and a glass dome for the head containing Ma’s soup. While it possesses superhuman strength, it does not have any extra weapons. Biology: Since Ma is soup, he doesn’t have specific DNA or organs, so poisons and illnesses have no effect on him. Ma does not have any sensory organs, so he experiences the world purely through his psychic abilities. · Sight: Ma see's with a kind of telepathic sonar, people appear to him as a sort of mood ring of both their physical attributes and projected mental self. Characters who are immune to telepathy appear to Ma as a static blurry outline. · Tactile: Ma cannot experience the same tactile sensation we can, but he can still sense if something is touching him. · hearing: Ma can hear, though it is unknown how. Powers: (Empathic Manipulation) Ma has the power to instantly read and understand a person’s emotions. Ma is not capable of reading a person’s thoughts directly, but has a Holmesian ability to gather information about a person by reading their emotional responses. If a person makes eye contact with Ma’s soup dome, Ma can give the person hypnotic orders to carry out actions. Under normal circumstances, Ma cannot force someone to do something outside of their moral code or uncharacteristic for them. Continued exposure to Ma’s hypnotic powers deadens a person’s emotions and willpower. This makes the person susceptible to complete brainwashing. Ma can tell these hypnotic zombies to carry out actions against the person’s moral code or personality, but only if the command is written or typed out physically as a one-word command or a very simple sentence. Ma’s hypnotic suggestion can affect machines of at least human-level intelligence, but does not affect creatures of animal intelligence or lower, those who already have no emotions, or those with strong willpower and resolve. But the prideful, arrogant, jealous, spiteful, or those with doubt in their hearts are all easy targets for Ma who will eat away at their emotional weakness causing them to slowly side with him. Weaknesses: Ma does have a soul and a mind (though it is not connected to a physical brain), so he can be affected by soul affecting magic, psychic attacks that don’t rely on manipulating a physical brain, and other such powers.While he is strong physically, he feels that engaging in petty brawls is beneath him so he is unskilled at combat. 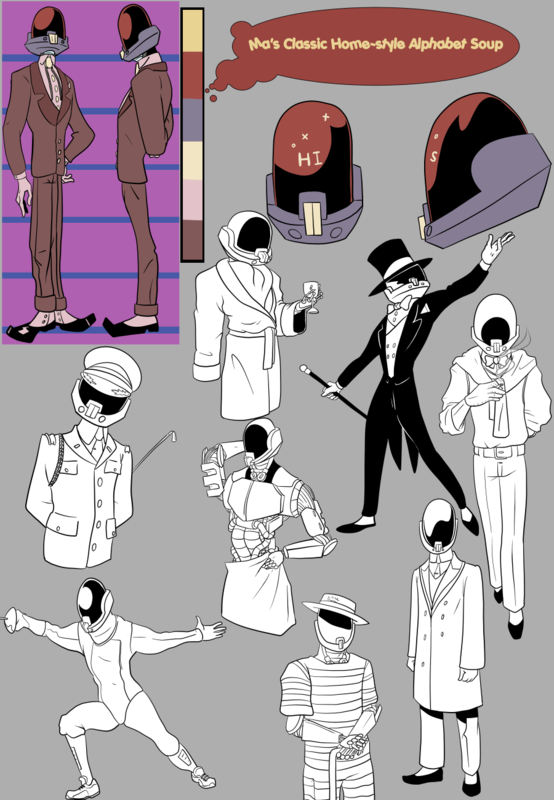 His robot body is susceptible to hacking, viruses, and other electronic attacks. Ma also possess a mortal fear of being eaten alive. Personality: Ma is very arrogant, and prefers not to get his hands dirty. He also has a bit of a Pinocchio syndrome, and acts out typical human activities that he can’t actually complete, such as smoking, cooking, sleeping or pouring glasses of alcohol. Ma is a perfect sociopath, he understand emotions on an intellectual level, but does not actually empathize with people. Ma outwardly presents himself as a philanthrope, and fools people into thinking that there is a caring soul under that suit using his fake sympathy and southern hospitality, but in truth he sees humans as vermin. Any kindness he shows is merely a way to manipulate people and hide his evil intent. Very much a control freak.